In many ways, this album can be seen as a continuation of On the Border. The sounds and style is basically the same. The difference, for the most part, is just about every song sounds well crafted and was given plenty of love and care in the recording studio. They actually came a long way from their earliest work that seemed to be much more of a democracy. By the time they got to this album, Don Henley and Glenn Frey were slowly emerging as the prime song writers and the "core" of this band. It's not necessarily that the other guys were being squeezed out, it's just that they seemed to be writing more original material with less outside writers. There's so much variety on this album, and most of it sounds so refreshing. This album boasted three top five singles, and none of them really sound like one and other. Of course it helped that each song was sang by a different Eagle, but that really doesn't matter. Lyin' Eyes probably deserves the award for the most "Eagle" sounding Eagle song, that has just enough country in a pop song to highlight the best characteristics of the band. It never sounds "long" even at a length well over six minutes. The irony is that the title track, one of the other top five hits, should get an award for the song that sounds least like The Eagles. This is a funky, danceable, sort of groovy song that shows absolutely no signs, nor hints, of anything they've ever done. 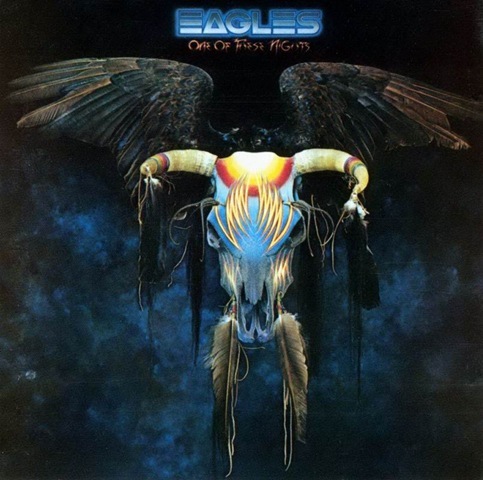 Then, to confuse the fan even further, they scored big as well with the grandiose, orchestral heavy Take it to the Limit, which is another one of the most popularly known Eagle songs, and their only hit to be sang by original bassist Randy Meisner. Looking at the diversity of the three hit singles, it's almost a bit surprising that nothing else was released as a single. They certainly could have scored huge with Hollywood Waltz, or the Frey-Henley co-sung After the Thrill Has Gone (actually, that was included on Greatest Hits Vol. II, but that was more to fill up space than it was representing any kind of "hit"). Even the Bernie Leadon penned I Wish You Peace is sort of heartwarming charmer. It would sort of serve as his "farewell" to the band, and I honestly don't know if he, or anyone else knew it at the time. Leadon's other track, the instrumental Journey to the Sorcerer is a bit of a mixed bag. It has a lush, classical string session backing up the song, yet at the same time has Leadon picking through the tune on a banjo. It's a bit of a weird listen at first, but it does grow on you in a strange sort of way. Don Felder helps write the other two songs, Too Many Hands with Meisner and Visions, with Frey and Henley. Both of the songs are strong and have their merits, but don't quite match up to the rest of what's here. Had this band not followed up fifteen months later with Hotel California, this album may have "stood out" significantly more than it did. It was incredibly well received when it came out, and it has aged tremendously well, so that alone should, and probably is, more than enough.